One of the most common ways of storing stamps is in a stamp album. Brand name albums come with pre-printed pages and stamp illustrations on them which the collector can use as a guide for placing his stamps. What if you don’t want to follow the format of a pre-printed album? What are the best materials to use to store your stamps in an attractive and organized manner? There are many options available: build your own stamp album, or use a stock book. Generally, a stock book is used to store your surplus, since the strips don’t allow for the best visibility. Also, depending on their size, your stamps may still be partially exposed. Therefore, the best would be to build your own, personal album. Before buying anything, you need to plan the lay-out of your album pages. Do you want the stamps to follow a chronological order? Do you want to organize them according to topics? Once you decide upon your layout, then you are ready to decide what to purchase to keep your stamps housed attractively and safely. It is still necessary to use high-quality materials, since some no-name products could contain chemicals which, if they came in contact with your stamps, could damage them. Firstly, you need a stamp binder. You may purchase a binder from any local shop in your area. Make sure that it is at least two to three inches thick; anything smaller will probably be filled up too quickly and you will end up with too many binders on your shelf. A two to three inch size is easy to handle; anything larger and you will have so many pages inside your binder that they may get damaged around the hole punches. 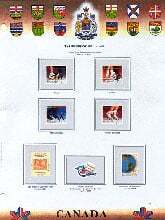 Arpin Philately also sells binders for use from well-known stamp album companies. Secondly, you need pages. It is important to choose your stamp pages carefully. A stamp page must be relatively heavy weight in order to be able to support all the stamps once they are affixed. You don’t want your pages tearing when your turn them in your album. It is best to use pages made expressly for stamp collecting. Arpin Philately has a nice selection of blank pages for you to choose from. You can also purchase our blank pages in a quad-ruled format, which enables the collector to line up his stamps easily. It all depends on what kind of a look you want. 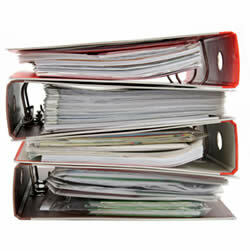 Make sure you pick the correct size, all of our pages come in 2 or 3 hole punch, in 8½ x 11 or 9 x 12 paper size. If you want to have page headings, then you can slip these pages into your printer for a custom-made heading. If you like, you can even separate your pages with glassine interleaves, providing even more protection. If you are using a binder puchased from a paper supply store, it would be a good idea to insert a glassine interleaf at the very front and back of the binder, to make sure that the stamps don’t come into contact with it. Thirdly, you must decide how you are going to affix your stamps to the page. If your stamps are all used, or if they are mint hinged, then you can use stamp hinges without lowering the value of your collecting. A common complaint for older hinges is how hard they were to unstick if ever you wanted to move your stamp around. 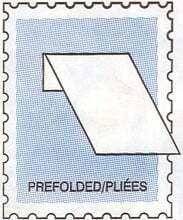 Arpin Philately only sells peelable stamp hinges. However, if you are storing mint unhinged stamps, then your best bet is protective stamp mounts. These protective strips adhere to the page and allow you to slip your stamp inside. Pick the correct height for you stamps, and then trim the width. Arpin Philately sells packages of protective stamps in various sizes, everything from the perfect size for the smallest stamp to the largest souvenir sheet. Keep in mind which backing colour you want. If you want to preserve the whiteness of your page, then choose a clear backing. If you want your stamp to really stand out on the page, then a black mount is best. A few simple tools are all that you require to have an album which will last for years, and which represents your personal collecting personality. Good sound advice. Sounds like the author has some years of experience. Wish I’d read this a few years ago, before investing a lot of $ in various sizes of plastic slip-mount strip pages. Very heavy, very bulky, and impossible to organize b/c different size stamps have to be on different pages. I’m keeping the pages now only for specific mint or pricey sets. I would love advice about how best to incorporate protective pages in standard albums, though – they tend to stick out a bit, but keeping plastic pages together in separate binders breaks up the collection. Thanks for your question. If you want to incorporate plastic protective pages into an album, you will have to put up with a little discontinuity in apppearance. However, my suggestion is to mount your stamps on the album’s paper pages with stamp mounts. Every size is available on our website. If your plastic pages are black, then pick black mounts for a similar look on the paper pages. I like black best because the stamp really pops! Follow the your album’s stamp illustrations for placing your stamps on the paper pages, and use your plastic pages for storing any stamp that is not illustrated, or for any doubles you may have. Place these pages in between the paper album pages according to Scott numbers as best you can. One thought though, you may need an extra binder. Please let me know if you have more questions. All very good. The only thing is, I would like a more professional looking album with typed headings and information much like the ones produced by Scott and Stanley Gibbons, with allocated spaces (and mounts) for all the stamps of my particular interest, British Overprints, (they don’t do one so specialised). This would probably require some computer graphic skills, which I do not have, together with a very good laser to accommodate the better quality paper.